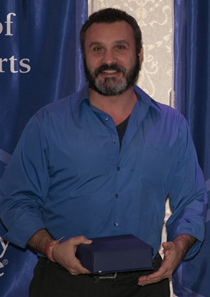 Photo Caption (above): Professor Jonathan Weidenbaum, PhD, Humanities and Social Sciences, Berkeley College School of Liberal Arts, receives the Excellence in Teaching Award during the 2018 Berkeley College Faculty Recognition Awards dinner, held on November 14, 2018, at The Terrace in Paramus, NJ. “To me, a great teacher is one who synthesizes a love of ideas, a passion for human interaction, and perhaps, a trace of theatre,” said Dr. Weidenbaum. “I aim toward excellence as an educator by igniting the souls of my students and guiding their minds toward a life of continual intellectual growth and curiosity.” Dr. Weidenbaum is a resident of Ridgewood in Queens, NY. Below (L to R) are: Eva Skuka, MD, Dean, Berkeley College School of Health Studies; Doris Alvarado, MD, Berkeley College School of Health Studies; Donald Kieffer, PhD, Dean, Berkeley College School of Liberal Arts; Michael J. Smith, President, Berkeley College; Beth Castiglia, PhD, Provost, Berkeley College; Jonathan Weidenbaum, PhD, Humanities and Social Sciences, Berkeley College School of Liberal Arts; Kevin Luing, Berkeley College Board Chairman; Elana Zolfo, EdD, Dean; Jonathan Ng, PhD, Management; and Ronald Boswell, Accounting and Finance, all of the Berkeley College Larry L. Luing School of Business(R). Drs. Alvarado, Weidenbaum and Ng are all recipients of the Excellence in Teaching Award. Mr. Boswell is a recipient of the Commitment to Students Award.